Buddhism, The Savior To Saving Snow Leopards? – Polly Curtin Certain regions upon this earth are so cruel that any species which survives in such areas gains a profound status. To even exist in such areas is an accomplishment, but when a species thrives, such a creature … Continue reading Buddhism, The Savior To Saving Snow Leopards? Pandas – Putting The ‘Con’ In Conservation? Why saving the joke of the animal kingdom may have been worth it. -Miranda Burke That inspired title might imply to you that I think saving these abominations was a bit of a ‘con’. This has always been a widely … Continue reading Pandas – Putting The ‘Con’ In Conservation? Insect Altruism – Have The Insects Got It All Wrong? -Antony Ho Would you feel comfortable with the idea of voluntarily exploding your entire body on the off chance that by doing so you would be able to protect your home, maybe a bit like a “good” terrorist? Probably not… But … Continue reading Insect Altruism – Have The Insects Got It All Wrong? Come along to the RHUL science fair this Saturday to meet the Scientists Scribe team and purchase your very own copy of the latest edition! 🎉🧬🔬🦠🧪🧫📚 Are you a second year choosing your third year project? We have an article for that! Are you interested in HeLa cells? We have an article for that too! This is the team of 2017-8. Quite a friendly looking bunch don’t you agree? Would you like to join us? Send us your articles for a chance to see your writing published in our next edition! Interviews will be held on Wednesday 6th of June. Email scientistsscribe@outlook.com with a brief describing what you envisage doing with this role in the team and attach your CV. Applications close 6pm on Tuesday 5th June. Good luck! Issue 12 of The Scientists’ Scribe is now ready! 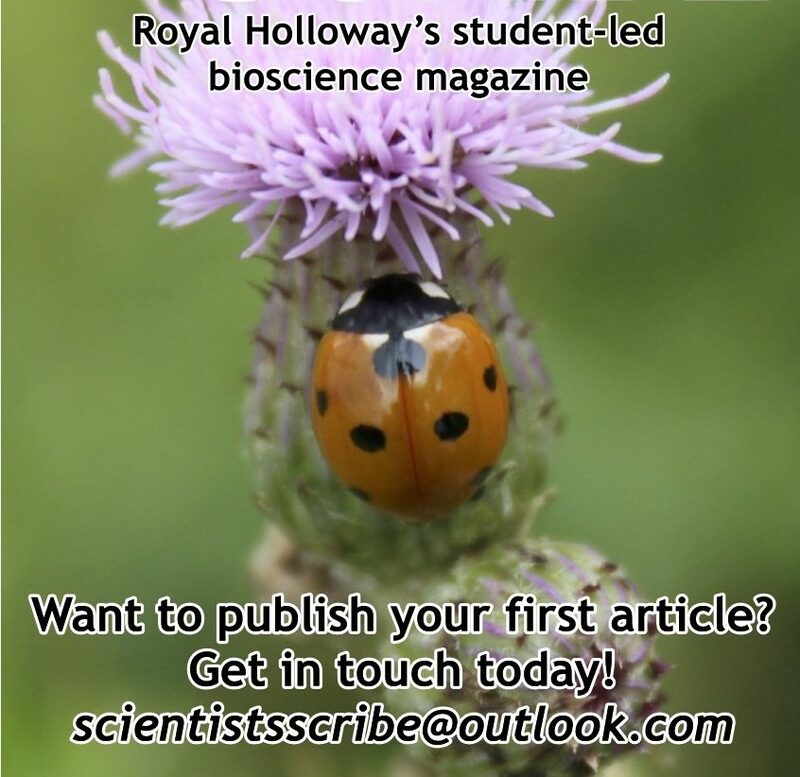 Articles on #lymedisease #pharmaceuticals and #birds feature in this issue as well as career articles. All you bioscience students make sure all you get to BioSoc's event!